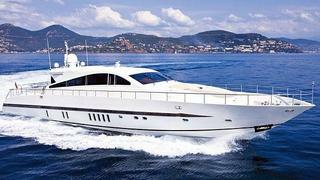 Lucrecia Vogogna at ISA Yachts asks me to mention that they have the Leopard 27m motor yacht Splendida for sale. Built by Arno in 1999 to a design by Paolo Caliari, her mahogany and cherry interior accommodates six guests in two doubles and a twin stateroom while twin 1850hp MTU engines give her a cruising speed of 30 knots. Splendida is asking €1.2 million.